The Ho-Chunk Nation Health & Wellness Division is planning a Holiday Social Dance. 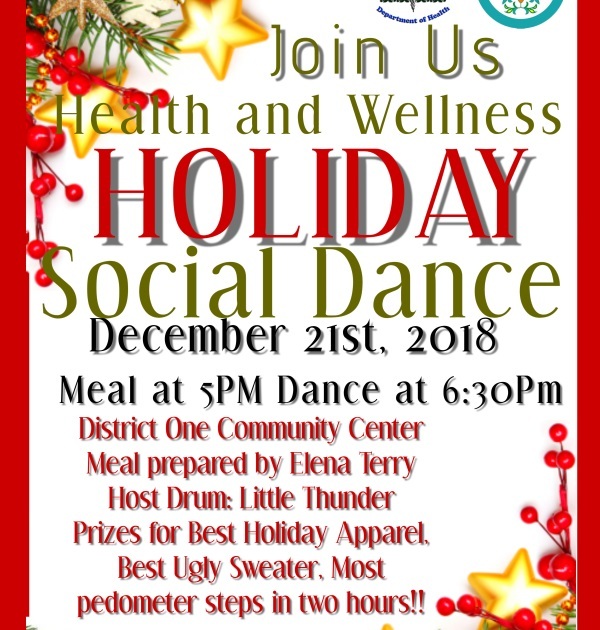 The dance will be hosted by the Health & Wellness Division at D1CC on Friday, Dec. 21, at the District 1 Community Center in Black River Falls. To start the evening, a meal will be provided at 5 pm and the dance to follow at 6:30 pm. The meal will be prepared by Elena Terry of Wild Berries and will include a variety of native foods. In conjunction with the dance, the Health and Wellness Division are searching for two fancy dancers. The dancers will be dressed up like the Grinch and Santa Claus (attire will be provided), and gather for friendly competition dance-off. The audience will decide who the dance-off winner is. Everyone is welcome. Dances are encouraged to bring family and friends to join the gathering for some serious holiday fun. Prizes will be awarded for the best holiday apparel and the ugliest sweater. “We haven’t had any social dances in a long time,” said Sara Peterson, Health and Wellness Coordinator. “This is the first Holiday Social Dance the Health and Wellness Division has hosted”. Every Wednesday night, the Health and Wellness Division hosts a Girls Pow Wow Dance Class at D1CC. That class will be cancelled the week of Dec. 21 for all to attend the Holiday Social Dance as a family. To keep everyone motivated and moving, a pedometer will be handed out to each participant at the event. The participants with the most steps will be entered to win prizes. The walking track at D1CC will also be open to rack up some additional miles. “It will be a great time and an entertaining way to keep moving,” Peterson said.